We have been so busy setting up household in Galveston that I have been lax in catching up this blog. This posting covers our final 2 1/2 weeks aboard S/V BeBe. Likely, I will make one more final posting later this year covering our adjustment back to land life. That is something that people often wonder about -- how does one adjust back to land after cruising for more than a decade. Too soon yet to know how that will go. On 11 January 2017 new owners Dan and Lori Carlson arrived in St. Thomas. We had docked at American Yacht Harbor marina in Red Hook in order to make their moving aboard as easy as possible. Good thing we had booked 2 nights in this marina because half of their luggage did not arrive with them. It was delivered to the marina the following day. Dan took the opportunity while tied to the dock to go up and check out things at the top of the mast. Wind was high so that also was a good reason to hang around the marina for an extra day. As we motored out on Friday the 13th (shudder! ), unbelievably, that wind instrument again acted up!! Is there no end to this problem! Bill realized as we motored out that the instrument once again reported erratic readings after strong winds and heavy rain. This convinced him that we were getting water intrusion into the sensors. Since every component had been replaced more than once, the only thing left to replace was what is called the control mount. It is a mount built into the end of a cable which runs through the mast down to the Hydra 2000 at the nav station. The wind instrument attaches to the control mount at the top of the mast. We had this part but had been unable to hire anyone to do this work and I did not want Bill going up there again. He had some minor surgery on his thigh last September and each time he went up the mast that incision area was irritated. Thankfully, Dan is quite comfortable going up the mast. We motored to Francis Bay and as soon as the wind slowed Dan went up and replaced the cable; he re-mounted the wind instrument and all worked perfectly once again. Think we finally had a fix!!! All this and more was stored in the cockpit lazarette. almost every time he gets in there. One day we went out for the first sea trial and all went well. Winds were about 20-knots. We sailed from Francis Bay northward to off western end of Jost Van Dyke; turned around and returned to Francis Bay. Seas were lively and winds were a little high, so perfect conditions for a sea trial. Dan and Lori could see that this 53-foot ketch handles differently than their 30-foot sloop back up on Lake Michigan. Much heavier (and slower, most likely) and very comfortable and safe. After a few days we motored over to Soper's Hole to clear into BVI; then sailed in ultra-light winds to The Bight on Norman Island. Dan flew the Secret Sail for awhile. The Secret Sail is the mizzen ballooner which we have had placed into a sock; basically an asymmetrical sail flown from the mizzen mast. I have always especially liked this sail. It can add up to 1 knot boat speed and really balances the movement of the boat comfortably. On this particular day the wind was so extremely light BeBe got down to only 1-knot speed over ground! But Dan had fun playing with the sail and it is best to learn new sails in calm conditions . Finally we started the engine so we could arrive well before sunset. We anchored in about 10-meters depth just inside Treasure Point. We all felt that it was okay to anchor on this lee shore only because winds were so light and forecast to remain benign. Jose Van Dyke in center background. The following day we motored to Marina Cay since there was no wind whatsoever to sail. The following morning Dan and Lori took the dinghy across the channel to Beef Island to go to mass. That afternoon we motored to Lee Bay on western side of Great Camanoe Island but the northern swell made that bay untenable. We continued motoring past Monkey Point and picked up a mooring in White Bay on the eastern side of Guana Island. There we found free wifi with decent speed; guess it was provided to the mooring field from the expensive resort on Guana Island. How nice of them! Lori & Dan settling into their new boat. Next day was a gorgeous sail westward over the northern side of Tortola. Dan and Lori put out a pole to starboard for awhile and then took it in -- just for the experience to see how it works. Dan took the helm and sailed all the way to the entrance to Little Harbour at Jost Van Dyke. Just before going between Green Cay and Sandy Cay we crossed paths with a couple of Texas boats which we knew were in the area and had hoped to meet up with, Tammy and Bruce on Dos Libras and Janet Lee and Michael on Adventure Us 2. I have followed the blog for Dos Libras since they were berthed in Corpus Christi and had looked forward to meeting them. Bill and I had met Janet Lee and Michael in Kemah a few years back and wanted to catch up with them now that they were out cruising in their own boat. Both Dos Libras and Adventure Us 2 went on into Great Harbour while we stayed overnight in Little Harbour. The next day we moved over to Great Harbour and we all met up for lunch at Foxy's. We enjoyed this very much. Great to meet up with fellow Texans. And I very much enjoyed listening to Tammy and Janet Lee tell stories of their first year or 2 out cruising. Both boats just arrived in the BVI after spending last hurricane season in Puerto Rico followed by short visits to Culebra and the USVI. So, while not really newbies, neither are jaded long-term cruisers. I enjoyed seeing and listening to their excitement about their 'new' experiences, which caused Bill and I to remember how we felt at that stage of our first few years out. and Lori & Dan, new owners of BeBe. Bill is not in photo because he is behind the phone camera. Lunch at Foxy's on Jost Van Dyke. Excellent way to end our cruising years -- with friends at a beach bar. A famous hammock. Guess where? Next day we motored over to Caneel Bay to pick up a mooring in order to clear into USVI once again at Cruz Bay. Officialdom satisfied, we motored back to Francis Bay for our final night on a mooring. The following morning we removed the bimini extension and mesh shade panels and folded down the bimini so that Dan could practice using the bow thruster to maneuver the boat in reverse as practice for docking stern-to in a marina. He backed up perfectly to a mooring several times and it appeared that he could handle the boat in reverse just fine. When we arrived at the marina another boat was in our reserved slip -- the only slip that this marina has which can accommodate a boat the size of BeBe. A smaller sailboat named Sunquest was in the slip and refused to move. He was waiting for a new transmission to be delivered in 2 days and said he would not move from our reserved assigned slip. The marina office advised us to temporarily dock at the T-dock. Dan tried to reverse BeBe to the dock but got confused at some point and turned the helm the opposite direction and also pushed the joystick for the bow thruster in the wrong direction. The wind caught the bow and there was no way to recover correct direction because of the strength of the wind off the bow. We came within inches of ramming the stern of BeBe into the dock but Dan managed to go hard throttle forward just in time to avoid collision. A learning experience. He recovered control and re-positioned the boat and was able to reverse to dock the boat on the second attempt. Now to settle the problem of that boat in our assigned slip. I loved it when the guy told me that "It is all taken care of; I am not moving." I told him he might be all taken care of but we were not yet taken care of; and that we could not remain on that T-dock. Bill and Dan visited the marina office and soon Sunquest was moved to another slip which could accommodate that smaller boat. Do not need an engine to move a boat; lines and dinghies can do that just fine. Now that guy really was 'taken care of.' And so was BeBe. Dan was able to reverse BeBe into the assigned slip perfectly. Bill stayed with him, standing near the helm to talk him through the process. At one point the boat was reversing too rapidly and Bill moved the throttle from reverse to forward to stop the backward thrust or we might have hit the dock. Other than that one little issue, Dan docked in reverse just fine on this attempt. This process is something that becomes easier with practice and BeBe is still new to Dan and Lori. So docking and reversing in tight quarters is stressful for them, I'm sure. They will gain confidence with more experience and practice. For our final night aboard BeBe, Dan and Lori hosted us for dinner at a nice restaurant. It was a pleasure to enjoy a fine meal in a nice restaurant; a true treat for us. Our flights home were uneventful. We arrived in Houston after 1 a.m. and had booked a room at the Marriott right there in the airport. We had rented a small SUV to handle moving all those duffle bags to our home in Galveston; ended up making several trips transporting as many things as possible the following day; then that long drive back up through the city out to the airport in order to turn in that rental vehicle. Shame they do not let people rent vehicles at IAH and return those vehicles to Hobby airport; that would have been much more convenient. ""I leave you with one last thought, from one of my favorite philosophers. If you've never read him, or not for many years, I urge you to take the time now. His name is:....Winnie the Pooh. "How lucky I am to have something that makes saying goodbye so hard."" Please note a new blog tab titled "Next Step (new)"
It has been a fabulous 11 years! It is called New Year's Eve all over the world but in the BVI and sometimes in the USVI this night is observed as Old Year's Night. This year we enjoyed an impromptu mini-celebration aboard BeBe with 'new' cruisers John and Cat Fearnow, owners of catamaran Heaven, to raise a toast to the end of 2016 and welcome in 2017. True to cruiser form, our celebration ended well before midnight. But we did share a bottle of Moet & Chandon, followed by a steak dinner. As always, enjoying the conversation made the evening. Glad they joined us. Recently while moored in Soper's Hole at West End of Tortola we rented a car for a day. Having a rental car allowed us to visit a few very old friends at The Moorings and Sunsail base in Road Town. We very much enjoyed chatting with them and also enjoyed a delicious lunch at the restaurant there. The base has changed a lot since Sunsail was moved to the same location as The Moorings, and their secondary charter company Footloose vacated the area to allow more expansion room for Sunsail. And The Moorings has expanded by addition of 2 more long docks toward a newer seawall. The staff have their hands full maintaining operation of both these charter company brands. Quite the fleets! And the director of operations told us they still had 40 more boats laid up in the hurricane hole area because have no space for them at the docks. It appears that the lower valuation of both the British Pound and the Euro has greatly affected the charter business this high season, as there are fewer boats out on charter at a time of year when both Sunsail and Moorings are often fully-booked. This portends of bad financial news for all the businesses in the BVI and somewhat in the USVI. While exiting Road Town to drive back to Soper's Hole we picked up a couple of hitch-hikers. We could tell they were cruisers (we are all easily identifiable by our well-worn and very casual clothing), so had no qualms about giving a ride to these strangers. Turns out they were Canadians who had planned to be in St. Martin by now but due to the high easterly winds they were 'stuck' in the BVI. They had to go into Road Town to request visa extensions. We were happy to help them out with a ride back to West End. But they would have to wait while we stopped at the Island Department Store to shop for duffle bags. Turns out they were not familiar with this store and were as delighted as we were to discover it. Wish we had known about this department store years ago as it sold things not found anywhere else in the BVI. Including the duffle bags we had just about given up hope of finding. We dropped the 2 cruisers off near the dinghy dock next to Customs and Immigration in West End and on the spur-of-the-moment decided to see where another road might lead us. This very narrow road led us up the mountain, where near the top the road deteriorated horribly. The rental vehicle was a small SUV, thank goodness; so it was able to navigate the very rough terrain. The road was washed out in many places; very steep inclines; and very narrow. We did not encounter any other vehicles until near the sea level on the northern side of the mountain. We were on a search for the hotel where we stayed in January 1984 after a week sail on the Windjammer ship named Flying Cloud. And we found it! It still amazes me that I booked us into small hotel so off the beaten track. This was during the pre-internet days! However did I find out about Sebastian's on the Beach! It is a small and very casual beach hotel situated on Apple Bay and pretty isolated. Bill was working himself to death that year and I wanted to give him a couple of weeks away from everything. These were the days before fax machines and cell phones and I wanted him to have a break from all things job related. So I booked us for a week aboard the Flying Cloud, followed by a week at this small isolated beach hotel. Turned out to be a great choice. I did not want to turn around and return via the awful road back over that mountain, so we continued onward toward Cane Garden Bay. Which is another place for which we have many wonderful memories from many visits spanning over 30 years. And it looked like really nothing has changed. That famous tire swing on the beach was lost years ago...but has been replaced by another tire swing on another leaning palm tree on a different place on the beach. Myett's is still Myett's. And Callwood Rum is the same as it has always been. The beautiful cute little 5-year-old girl who gave us such a detailed tour of the distillery is now a grown woman with children of her own. But the family distillery is same as ever. behind it. Today was the day. We had just enough time to fill-up the gas tank and return the car before the rental agency office closed for the day. This had been a very enjoyable day roaming around the island. Sorry, no photos because I forgot to bring my camera. Bill was busy driving and I do not use his cell phone for photos. It was time to replace a few of our batteries. We had bought 6 batteries in Montenegro which were dual-purpose batteries rather than the marine variety which were not available in that country. We bought what we could get knowing these would not last as long as the proper marine batteries. These lasted 2 1/2 years so we were not disappointed in their performance. Two of the 6 had developed internal shorts; so we planned to replace all 6. The 6 marine batteries which we had purchased earlier in Turkey were still perfectly good. Bill notified the buyers of BeBe about the battery situation and the new owner asked us to replace all 13 batteries so he could start fresh and he would pay 1/2 the cost. The 13 batteries had been ordered a few weeks earlier and were ready for delivery, so we took the boat into American Yacht Harbor for a night. 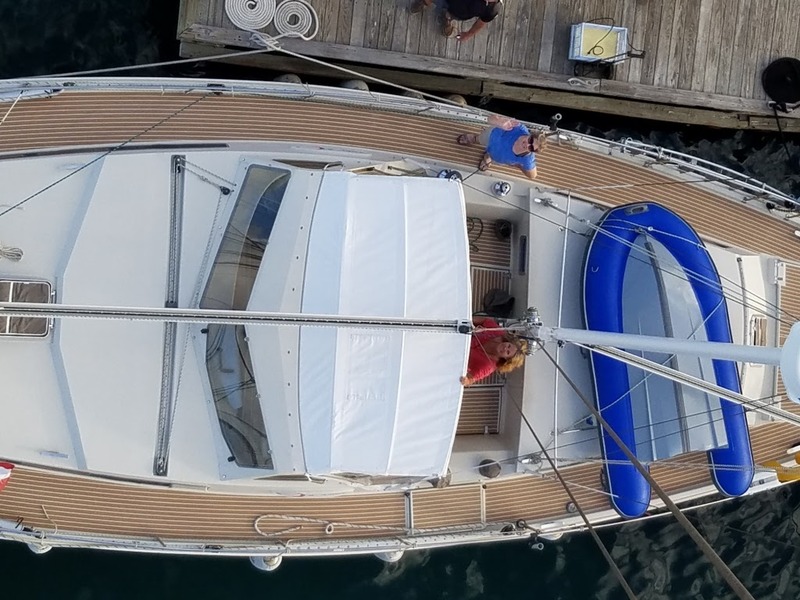 Bill and I are too old now to deal with lifting 13 batteries up out of the battery compartment, up the companionway steps, over the cockpit seats, over the life rail and down to the dock. Each battery weighs nearly 100-lbs. That means 1300 pounds up and 1300 pounds down! We have done this ourselves but this time we paid 2 younger and muscular men to handle this heavy lifting. In the heat of the Caribbean. They were both dripping sweat with every movement. But the delivery went smoothly and they carted off the old batteries. A job well done! We stayed at the dock overnight to allow the new batteries to fully charge to float. While in the marina we enjoyed dinner ashore as a rare treat. Next morning we shopped Moe's Supermarket and stocked up a bit. This market is better than I remembered it. Now stocks just about everything one might want. High prices, of course, but at least they have whatever you need or want as long as willing to fork over that price. The only negative about our 1-night stay at the AYH marina is that the docks are badly in need of repair and literally ate up our fender covers. This now is an IGY marina and certain standards are expected and should be met. Those docks are sadly in need of repair or replacement. to us for a few days in Francis Bay. Back on a mooring in calm Francis Bay Bill went back up the mast several more times. I think the wind instrument finally is working correctly once again. Bill realized that each time it reported erratic readings was shortly after a heavy downpour; thus, he deduced that it was getting water intrusion somehow. Sure enough, the sensor was missing a tiny 'spacer' between 2 gaskets. Just enough to allow a few drops of water when winds blew heavy rain. The darn spacer could not have been more than 1/64th inch wide! Bill fixed that little problem and (fingers crossed!!) the wind instrument has worked fine ever since -- even after heavy rains. Last evening our friends Pam and Larry Shelton aboard Southern Girl arrived back in Francis Bay. They and their guests visited us for a few hours for sundowners aboard BeBe and we enjoyed chatting. Their friends also are ex-boaters; they sold their boat last year and talk about it as if they still owned it. Hard to make that adjustment to no longer owning a beloved boat. I can relate; giving up BeBe is going to be a MAJOR adjustment for me. Southern Girl left the bay this morning. There are 2 other Texas boats in USVI right now and we hope to catch up with them soon -- Dos Libras and Adventurous Us 2. We returned to American Yacht Harbor on today. The new owners of BeBe arrive this evening and we decided being docked in a marina would make transfer of lots of luggage easier. We will enjoy sailing with the new owners until January 27. The first week, however, might be a bit too rough as a major cold front passes through and is predicted to cause high winds and large swell for almost a full week. Christmas day was an ultra-quiet celebration for us this year. Ten years ago we spent Christmas day anchored in nearby Christmas Cove on the eastern side of Great St. James Island. There, we enjoyed watching boats come and go all day as Christmas Cove is sort of the traditional place to spend Christmas day in the USVI. This year neither of us felt the urge to go the short distance there -- and then have to deal with coming straight back into the wind to return to Francis Bay. And we have come to really enjoy being in Francis Bay on St. John. For a change of scenery a few days past we sailed up to Great Harbour on Jost Van Dyke. The first day there weather was lovely. On Christmas Eve day we went ashore for lunch at Foxy's -- a 'must do' anytime one stops at Jost. Foxy chatted with us and bought us a drink on the house to honor our having sailed around the world since last seeing him. Foxy told us that when his youngest daughter graduated from university that he wanted to give her a trip around the world in 80 days -- as the classic Jules Verne book was entitled. But he found that this was not possible. Instead, his daughter and her mom enjoyed a trip around the world in 90 days. A fabulous graduation gift! would lay in that swan & drink beer. By the way, years ago we chatted with Foxy's wife one day while Foxy was singing and joking with the band. She told us Foxy had no idea how much money he has; money means very little to him. That sure appeared to be the case as we watched him and saw how much he enjoyed telling stories to the audience and singing with the band while sipping rum in his world-famous beach bar and restaurant. Mama was the money person. Thanks mostly to her, each of their children has graduated from Ivy League universities in the USA. We did not see her this time and I was hesitant to inquire because feared she might have passed away. After all, they are getting up in years! I hope she is well and that we just missed seeing her that particular day. Foxy remains as always, full of life and joy, and completely unpretentious, while being one of the wealthiest (if not THE wealthiest) person in the British Virgin Islands. in the BVI. Looks like they have added onto it. available to rent for a nice relaxing vacation. Within minutes of returning to the boat after lunch Bill decided it was just too rough to remain in Great Harbour. He went back ashore to clear out, but found the officials were out to lunch and about 20 people waiting in the office to clear out. We upped anchor and motor-sailed over to Soper's Hole and cleared out there. That was faster than waiting for the officials to return in Jost and then waiting our turn in queue. Winds were solid over 20 knots and forecast to go higher and remain high for days. Francis Bay on St. John was looking better and better by the minute. That bay provides the best shelter from NE winds and swell. We were back on 'our' mooring before 4 pm. Next to us was S/V Allegro with Lee and Sharon aboard; this was the boat moored next to BeBe for the final 2 or 3 weeks in Trinidad. Just before dark several dinghies arrived at the stern of BeBe singing Christmas carols. These folks were Salty Dawgs. I do not know if they arrived in the Virgins with the Salty Dawg rally from mainland USA or if they arrived with the Salty Dawg North rally which sailed up from Bequia. That rally was in Bequia when we stopped there on our way north, but we moved on and did not attend their party. This was the first time we had heard of the northbound Salty Dawgs. I do not know if this is an annual organized event or if people who had participated in the southbound Salty Dawg rally the previous year got together and sailed north in an unofficial group. The Christmas carolers visited all the boats moored in Francis Bay on this Christmas Eve; then they gathered on one of the boats to party. They invited us to join them but I did not want to intrude on their party since we knew none of the folks except Lee and Sharon. The wind instrument which we thought again was working properly has continued to give us grief. Intermittently the readings go very low, indicating like 2 knots of wind when we know it is more like 20 knots. Most of the time it appears to be accurate but every once and awhile it indicates low readings. Bill has been to the top of the mast to work on this 6 or 7 times already. We now have 2 complete masthead units and each exhibits this identical intermittent low reading problem. We have a new mount with attached cable and want to have that installed. Since this is installed with 4 stainless steel bolts into the aluminum mast, we are positive that the 14-year-old bolts up there are seized. So it is time for a professional to do this replacement! Both BVI riggers we have contacted are booked solid until after 1 January, as is the B&G distributor. We are on the 'call list' for all of them and will give the job to whomever can get to it first. I find it difficult to understand that hiring someone for this job is so hard!! We would like to have the wind instrument in proper working order before the new owners arrive 11 January, but it looks like that will not happen. The rigger we spoke with in St. Thomas said he cannot get to this job until 26 January! Today we went into American Yacht Harbor in Red Hook bay on St. Thomas to have batteries delivered and installed. It was that time again! Only 3 batteries actually tested bad; the other 9 house bank batteries still tested fine. We were going to replace the 6 batteries that we bought in Montenegro since 3 of those are bad, and we were going to leave the 6 purchased in Turkey because all those are still fine. But the purchasers of BeBe wanted us to replace all of them (including the starting battery, which also still tests fine) and they will split the cost with us. We ordered the 13 batteries a couple of weeks ago and the shipment arrived in St. Thomas yesterday. Each battery weighs nearly 100 pounds. That would be 1300 pounds lifted up out of the battery compartment; moved up the companionway steps into the cockpit; moved up over the cockpit seats to the deck level; lifted up over the life rail and then down onto the dock. And then another 1300 pounds reversing all those steps! Bill and I have done this job ourselves in the past but decided we are too old to do such physical work anymore. Don't get me wrong -- we could do it -- but we would ache for days afterward! Time to pay someone else with stronger backs and more flexible legs for this heavy work. Batteries were delivered right on schedule and all tested fine. All installed and are charging as I type this blog posting. We are spending the night at this marina. Not sure where going tomorrow. What you want to bet we end up right back in Francis Bay again? A bright rainbow very close to our boat in Francis Bay on St. John, USVI. Sailing up the island chain is now somewhat of a blur in memory; so much so that I must refer to our log book to remember where and when. We arrived at Marina du Marin in Martinique on Thursday, 10 November 2016, and took a mooring, hoping to be there only 1 day so we could pick up a new propane gas solenoid from the Amel service center located in Le Marin. The solenoid had failed on our final day in St. Lucia while I was baking muffins. Gas supply shut down when the solenoid failed. Bill found a union fixture at a local chandlery and installed that as a temporary fix. The only solenoids available locally and online were the cheap kind and we wanted to replace it with exactly the same kind as original. This is a German produced solenoid and costs about 6 times the price of the typical cheap versions used in most boats. Bill telephoned Amel in Le Marin and learned they had 1 in stock, so we sailed up there. That was quickly completed and we were ready to head off again when received an email from the buyers of BeBe stating that they would like to have a rigging inspection performed while we were there at the Amel service center. There is a rigger nearby who is recommended by Amel. The following day was a holiday but the rigger agreed to do the inspection then rather than make us hang around until the following week. Next morning 2 riggers arrived shortly after 09:00 and 1 of them quickly was up the mast. Inspection took less than half-hour. The port side forward baby shroud had 2 tiny spots of discoloration near the upper swage. The rigger said these 2 tiny discolorations could be an indication that 2 of the 19 twisted wires might be broken inside the shroud. The rigger looked shocked when Bill immediately told him to replace the shroud. Bill figured might as well replace it now while at a place recommended by Amel – why take a chance; if there is any possibility of a problem with a piece of the rigging, then replace it immediately. We moved the boat over next to the rigger’s office and work facility and within 2 hours the shroud was replaced and we were motoring out of Le Marin. It was too late in the day to go anywhere so we anchored at St. Anne’s once again. Ended up staying there a few days before sailing 26.5 NM up to St. Pierre, where we anchored only overnight (rolly!! & tight spaces!!). At 05:30 the next morning anchor was up and we were motoring out of St. Pierre in the dark. This turned into a very lively day of sailing. Forecast was for 12-15 knots wind from 110 degrees but we never saw that. Actual experience was solid 25 knots minimum, mostly 30, with gusts to40 knots – from 40 degrees to 80 degrees! Forget that downwind sailing we were expecting. Wind was on beam or slightly forward of the beam all day. As we sailed well westward in the lee of Dominica the wind dropped to comfortable levels, but jumped right back up to ‘a bit too strong’ as we crossed the channel to Ile des Saintes. About half-way across that channel is when the top half of our wind instrument blew away. We still had apparent wind speed, but no wind direction. No more TWS, TWA, AWA; just apparent speed. Bill tied 2 long plastic strips on the aft mainmast shrouds on port and starboard and those little tell-tails acted as our means of telling apparent wind direction. Back to the basics! We entered via the southwest cut into Ile des Saintes – and would never do that again!! We had motored through this cut years ago with no problems, but today both the southwest and southeast cuts are filled with literally hundreds of fish traps. This could be a real mess if attempted during darkness or during rain when could not see the floats to maneuver around and between all those fish traps. I was very glad to put those behind us! Where we used to anchor near the town of Terre Haut is now all filled with moorings, so we picked up a mooring. Ended up staying there exactly 1 week. This is by far our favorite island in all of the Caribbean. We first visited Ile des Saintes way back in 1984 when took a Windjammer cruise aboard the Mandalay from Antiqua to Grenada. It was like a tiny piece of Brittany placed on a Caribbean island. We were impressed by the women outside washing their stoops and doorways in the mornings. The structures might be meager but the owners took pride in their homes and kept everything very clean. Those days are gone; the next generation living there today no longer go to the trouble of washing their stoops and steps and doorways each morning. A little sad to see this change. Bill went up the mast to assess the damage to our wind instrument. He ended up going up that mast 3 times and it still was not repaired. That would happen later. Bill posted on the Amel Yacht Owners Group and on the Amel Owners FB Group about the parts we needed. Lo and behold, several people who have upgraded to newer electronics offered up their old units for spare parts. Pat and Diane on S/V Shenanigans shipped exactly what we needed to Connections in St. John, USVI. We are very grateful to them! Connections is a mailing and shipping service in Cruz Bay which we used when we moved aboard BeBe in 2006. Great service and reasonably priced. 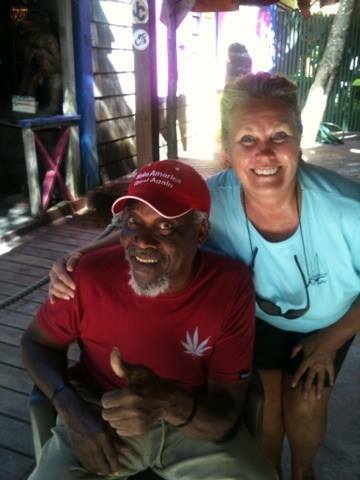 Also while in Ile des Saintes there was a chance meeting with another Amel owner. Derrick Gates on S/V Brava, along with crew members Doug, Roger and Gracie, arrived and moored nearby for a couple of days. It was a pleasure meeting them. Derrick treated us to delicious dinner at a lovely little garden restaurant; the French do know how to cook! Derrick has followed our blog and conversation was fun because he already knew so many of the places and experiences that Bill and I have enjoyed over the years. This was a very enjoyable evening for many reasons – companionship, conversation, food, discussion with fellow Amel owners. One of Derrick’s crew members also owns an Amel; I believe he said in Maine; and Gracie is his chef. We enjoyed drinks and snacks aboard Brava before going ashore for dinner and I can attest to Gracie’s skills as a chef. She produced some small fish cakes accompanied by a pickled lettuce garnish which tasted fabulous. Thank you again for a lovely evening, Derrick! Next leg of our island-hopping north was 35 NM up to Deshaies, Guadeloupe. Once again, there were many fish traps encountered going out the northwest cut from Ile des Saintes. If we were entering or exiting Terre Haut again, we would opt to go the extra distance and use only the northeast cut. That is where all the ferries to and from Guadeloupe enter and exit and there appeared to be no fish traps hampering that route. We arrived at Deshaies at 15:30 and the anchorage was pretty filled. All the moorings were taken, plus there were 18 boats anchored outside the moorings. And boats were pointed in every direction because the wind swirls through this bay due to the surrounding high mountains on 3 sides. We dropped anchor pretty much in the middle of the bay in 9.9 meters depth and could let out only 46 meters of chain. The bay was too congested to allow more scope. Turned out not to be a problem; holding was excellent. town of Plymouth when the volcano erupted not so many years ago. of the island. The volcano remains active. At 05:15 anchor was up and we were motoring out of the bay. An ‘Oh-Dark-Thirty’ beginning once again. It was a black pre-dawn exit with no problems. This day would be 78 NM to St. Kitts. We motor-sailed or sailed 75% and motored 25% of the distance. Our course was basically 320 degrees and wind 20 knots at 120-150 degrees apparent and 2.5 meter seas, which meant jib poled to port and plenty of rolling all day long. This time we skipped Montserrat, going up the western side well off shore to avoid any volcanic ash in the breeze. We have seen boats really messed up by that volcanic ash. It is so acidic and destroys gel coat on boats. Normally we have gone on the eastern windward side of this island but this time we decided to chance the western leeward side as that was better direction for our desired route. Thankfully, the volcano was not burping that day and we slipped past with no ash landing on BeBe. point protruding from the SW tip of Nevis. As we approached Nevis and St. Kitts squalls were building. I checked our log book and noted where we had anchored when last here in 2006. We headed toward that waypoint in Ballast Bay as a squall rolled through. I was very thankful to have that waypoint; knew if we safely went there 10 ½ years ago then we should be safe returning there today – even though we could see nothing past 25-feet around our boat. We dropped anchor and put up the yellow Q flag. into the sea. An optical illusion. The following morning we motored out of Ballast Bay just before 10:00 and almost instantly a large rib zoomed up beside us filled with Dutch marines and a guy who worked for St. Kitts (coast guard?). We slowed and several of them boarded BeBe. They did not even do a cursory inspection; 3 of the Dutch marines stood on the deck while the St. Kitts guy sat in the cockpit and filled out a form, just the basic information and basic safety equipment verification. He asked to see 2 lifejackets and the flares and confirmed we had VHF and HF radios. Everyone was very friendly and within 10 minutes they departed and we continued motoring away from St. Kitts. In all our years of boating this was the 2nd time we have been boarded. Coincidentally, the only other time BeBe has been boarded also was by the Dutch – in Curacao in August or September 2007. That time they searched the entire boat; this time was just questions. Each time everyone was very professional. The sail from St. Kitts to St. John was 146 NM and was very fast! Course once again was basically 320 degrees with wind 20 knots from 80 degrees. This placed jib poled to port and mizzen to port with preventer. The mizzen acts to reduce twist and roll in the 2.5 meter confused seas; large swell from southwest and wind waves from northeast. When in the lee of St. Kitts, again in lee of Statia and again in lee of tiny Saba, the seas calmed and sailing was very pleasant. Other than in the lee of those 3 islands, seas were confused and uncomfortable. When Bill glanced down and saw we were doing 10 knots SOG he decided to reef that jib! We continued under single reef until sometime during the night when boat speed again crept up to over 9 knots SOG and I put a second reef in the jib. Still our boat speed was faster than I prefer. We sailed 146 NM is 20 hours – averaging 7.3 knots SOG. And that includes the time for the Dutch marines boarding and the time motoring through the channel at St. John and finding a mooring at Caneel Bay. So the sailing average SOG probably was greater than 8 knots. I prefer 6.5 knots sailing speed. I do not like fast sailing. another mega-motoryacht. Eos anchored near us in St. Kitts. This final overnight sail was bittersweet. It marks the ‘last time’ and in some ways I am happy about that and in other ways quite sad about it. The ‘last time’ for watching the bio-luminescence flow down the side of the boat at night. The ‘last time’ for my enjoyable solitude at sea at night. The ‘last time’ to see the sky laden with hundreds of thousands of stars, as only can be seen from sea with no ambient lighting from nearby lands. The ‘last time’ watching other vessels pass in the darkness. I will so very much miss these things and am very grateful to have had these experiences. We picked up a park mooring in Caneel Bay, St. John, before 07:00 on Thanksgiving Day. We rested a bit and then went into Customs and Immigration in Cruz Bay to handle inbound clearance. While clearing in we learned that our LBO (Local Boaters Option) cards which we had obtained in November 2006 are still valid!!! The official said these LBO cards are “pure gold” because these are much better than the current SVRS program. With the SVRS program vessels are supposed to file float plans. With the LBO cards, we merely need to telephone when we arrive in USVI or Spanish Virgins or Puerto Rico. As long as we own this boat then these LBO cards remain valid, although these are not available anymore. Update: Effective 31 December 2016 all LBO information was purged from the systems. The only option today is the SVRS scheme. Biggest difference between the old LBO system and the SVRS system is that SVRS requires filing float plans online. Which can be difficult since cruising boats are not connected to the internet 24/7/365. That afternoon I roasted the small piece of turkey which was purchased at Ile des Saintes. Our Thanksgiving feast was comprised of roast turkey, peas, mashed potatoes and gravy and followed by pecan pie. The worst pecan pie I have ever baked, but appreciated by both of us regardless. This was an impromptu Thanksgiving meal as we had thought we would be at sea all day. The following morning we loaded 7 of the 10 boxes of books which I had packed back in Trinidad and took these to the US Post Office in Cruz Bay. There we learned that for whatever reason this particular post office location will not allow any shipments in boxes which have names of liquor or beer or wine printed on the outside. The clerk said those alcohol boxes are the strongest boxes but she is not allowed to accept these for shipment. She loaned me a black marker and I crossed out those offending words on some of the boxes, but the Heineken boxes had the word Heineken all over them. We took these boxes down the street to Connections, where we purchased heavy brown paper and packing tape and wrapped the boxes. Then back to the post office and shipped them. We returned to the boat for the remaining 3 boxes and got those posted also. Got to love the US Post Office right now! They consider USVI as domestic postal rates and also allow media rate from here to the mainland. We shipped 200 pounds of books in 10 boxes for total cost of around $130. That is a deal! While at Connections we picked up the package of wind instrument parts shipped from Pat and Diane on S/V Shenanigans. They were life savers! These parts are exactly what we needed. Bill has already tested everything and between what we had and what Shennigans gave us, it all works perfectly. If it works down here at deck level then it should work when mounted at the top of the mast. All the shipping taken care of that could be handled this day, we slipped the mooring line and motored over to Francis Bay at the northeastern side of St. John. This bay brings back many memories of our charter days with friends back in the 1980s and very early 1990s. The following day friends Pam and Larry Shelton on S/V Southern Girl arrived from the BVI. It was great finally catching up with them while on our respective boats. Pam is one of those friends with whom we chartered back in the 80s and 90s. They headed off towards Puerto Rico the following morning, while Bill and I remained on this mooring for several more days. We have made a couple more trips to the post office to ship more boxes, each time returning to the same mooring in Francis Bay. Bill has installed the repaired wind instrument on top of the mast and all works perfectly once again. I am very glad this is so. It was more difficult than I imagined picking up a mooring pennant without knowing the exact direction of the wind. Once we had to make 3 attempts to pick up a mooring. That is shameful! We normally get it accomplished effortlessly on the first attempt. On Tuesday, 2 November, we were up at 04:00 to begin the process of leaving the dock at Crews Inn Marina in Trinidad. This marina does not simply pro-rate the electricity for the final night docked as is common; they want an actual meter reading when that power cord is unplugged. We, of course, wanted air-conditioning for our final night at dock; hence, the extra early wake-up time. What’s an extra hour of sleep! Plus this provided the advantage of enjoying our morning cups of coffee before the last-minute rush to depart. The hotel desk is staffed 24/7. Bill had to awaken the dock master so he could read our electric meter; the front desk clerk prepared our final invoice; and at 05:00 we were finally ready to depart the dock. We waited around for another 15 minutes until sky was light enough to see well in this crowded narrow bay. BeBe went around the moored yachts rather than go through the middle of the mooring field in the still somewhat darkness, then headed straight for the Bocas channel. We were sailing this day in company with 7 other northbound yachts. We all had filed float plans with Trinidad officials with destination of Grenada. No Venezuelan pirate worries this day. Weather was great for the initial part of this passage. Cloudy skies, but plenty of bright clear blue patches, about 15 knots wind from SE on our starboard aft quarter, and positive current assisting us with an extra 2 knots of SOG. BeBe sailed and/or motor sailed for about 6 hours at over 8 knots SOG. We dropped a fishing line to trail once we had passed the Hibiscus gas platform. A couple of hours later that line sped out extremely fast! We had a bite and it must have been big! Within seconds the line snapped. Whatever it was had taken our newest and best lure -- what I call a treble treble. One that swims 10 to 15 feet below the surface and had 3 treble hooks. I prefer this type lure because, after all, the more hook barbs increases the likelihood of keeping the fish on the line until it gets gaffed and aboard BeBe. Goodbye best lure. No more fishing for us this day. And then our pleasant passage all changed. We had been watching the sky over Venezuela off to our SW all morning. The sky looked very strange – an odd cloudless solid dark steel gray-blue. Around mid-day the wind died to nothing; to pick up soon thereafter coming from the SW! That is really weird! The wind just never comes from the west in the Caribbean except during storms with circular motion like hurricanes. (Except for 1 day in February; almost every year for 1 day in February west winds usually surprise sailors at some point in the Eastern Caribbean.) In all our years of sailing in the Caribbean we have never experienced westerly winds or southwesterly winds during November. That weird inversion over northern Venezuela caused some strange weather. The SW winds stayed up for hours. As we approached the SW tip of Grenada the winds switched to come from the NE at 18 knots. This was one strange day of Caribbean sailing. We changed sail configuration more frequently than ever has been needed in the Caribbean on one day. We started off with jib to port; then jib poled to port; then jib poled to starboard; then to starboard without pole; then back to port as we beat into 18-knot headwinds and 2-knot adverse current for the final few hours. We sailed 91 nautical miles, arriving in the St. George’s anchorage at 19:00 in pitch blackness -- no moon and no stars, with many strikes of lightning off to the west. It was impossible to see some of the boats as we slowly crept into the anchorage. Boat owners who use those garden lights have no idea how poorly lit their boat appears as someone approaches an anchorage in pitch-black darkness with the shore lights in background. When I suddenly saw a boat to our starboard because it swung a bit and the shore lights displayed the motion of that dark boat, I pleaded with Bill not to attempt to go any further. We dropped anchor at that point in 8 meters depth and put out 55 meters chain. Ended up being the boat farthest out in the anchorage and that was fine with me. The next day I saw that the boat which we could not see at all in the darkness was painted a bright orange on port side and dark blue on the starboard side. We could see neither color at night and this boat did not display any form of anchor light. It was pure luck that we did not have a collision. Santana) every time we look at it. The following day we met up with Turkish friends Hasan and Zehrya on S/V KANDIBA. They had returned from a summer in Turkey only the previous day and it was great catching up with them. They presented us with a small silver dish for our home in Galveston. It is stamped with the symbol of the Ottoman Empire as a remembrance. Hasan and Zehrya plan to head to the South Pacific early next spring and it is very unlikely we will see one another again. They hosted us for a delicious dinner at a restaurant in the Port Louis Marina. I enjoyed sautéed shrimp and leeks and it was cooked to perfection. The next morning we upped anchor and sailed to Carricou. This time we sailed about 1 ½ miles off the western coast of Grenada. This allowed us to catch more wind than if hugged the coastline. We went west of the exclusion zone for Kick’em Jenny, the active underwater volcano situated slightly NW of Grenada; then angled to beat into Tyrrel Bay, Carricou, arriving just in time to launch the dinghy for Bill to zoom in to handle departure clearance from Grenada and Carricou before closing hour. That evening we enjoyed a special treat of a lobster dinner ashore. On the way to the restaurant we noticed S/V FROST and stopped to chat a moment with Mike and Rebecca. We last saw them in Martinique last spring. The lobster dinner was unusual, cooked differently than the typical boiling or grilling; these were pan seared tails. It was good but did not compare to fresh cooked on our boat. The highlight of the meal was dessert of homemade buttered almond ice cream. THAT was delicious! Roasted almonds cooked into a butter brickle and then broken into homemade ice cream. Whoever invented this recipe has a winner. Early Sunday morning we upped anchor and enjoyed a day of sailing perfection up to Bequia. We went west of Union Island, skipping Mayreau and Canouan and Mustique. We talked about going to Mustique once again because the wind was of good enough direction to allow us to sail that far eastward; but decided that we will cherish our memories of that special island. We have visited Mustique 4 times. Why chance a 5th visit and possibly destroy our good memories there if it has changed, which inevitably is the case. We continued onward to Bequia where we anchored for only 1 night. Good memories of that island many times too. Thirty years ago there were maybe 5 cruising boats anchored in Bequia; today there were about 200. Sigh….is this better for the local people? I fear the island rapidly is becoming too dependent on tourism and they are losing their traditional ways of life. I am not certain this is a good thing in the long run. On Monday, 7 November, we departed Bequia at first light in company with several other boats headed north. The Salty Dawg Rally BVI had a rum punch party scheduled for Tuesday night and everyone was invited, not just the rally participants. But the wind was right to sail this day and would not be right if we waited to attend that party, so off we went. Since this would be a long day (70 miles) we opted to motor-sail until lost all wind in the shelter of beautiful St. Vincent; then we motored until just past the northern side of this very high island. There we again caught the wind and were able to sail to St. Lucia. The topography of the island of St. Vincent is gorgeous. It might be the most beautiful of all the Caribbean islands -- but we have not once stopped there because of the high violent crime against cruisers. This is well-known and has gone on for decades. Too many sailors have been attacked by men wielding machetes and guns for us to consider stopping there. Such a shame. Anchor was down at Rodney Bay, St. Lucia at 16:15 so this was an excellent day! Motor-sailed or motored 56% and sailed 44% of the 70 NM trip. We were happy with that. This time we anchored closer to the beach than ever before. We cleared in and out, saying we plan to depart early the next day; then we hit the supermarket. That supermarket was the primary reason for coming here. I found 1,000 EC currency in a purse a few months ago. That currency is good only on certain islands of the Eastern Caribbean. We blew some of that EC cash on those lobster dinners at Carriacou and would spend the rest of it here in St. Lucia buying whatever. That has now been accomplished and it is time to move on to Martinique. Wednesday, 9 November 2016 – We stayed put for at least 1 more day even though we had already cleared out of St. Lucia. Our propane solenoid failed and the only replacements available in St. Lucia were the standard cheap models; we wanted the German produced original part (which costs about 6 times the price of the common solenoids sold in marine chandleries). We contacted Amel in Le Marin and learned they did have this part in stock; so, to Le Marin it would be – even though we had not planned to go there. There was a LO system which passed through on Wednesday and it would have been a miserable day at sea. When this weather system passed we sailed up to Martinique. But more nasty weather followed for yet another day. On Thursday we enjoyed a beautiful sail towards Martinique until the final 45 minutes. Off to the east the sky was black as far as we could see. We quickly took in all sails and turned on the engine and motored straight for St. Anne’s; no way we would attempt the long jagged narrow entrance channel into Le Marin during nasty weather. We arrived in St. Anne’s in a 40-knot squall, dropping anchor near the stern of the first anchored boat we could see through the water-filled air. We each grabbed something for a quick lunch while waiting for the squall to pass, then motored into Le Marin where we had arranged for a mooring for 1 night so we could pick up the solenoid from Amel. Mission accomplished. When we checked email we learned that the buyers of BeBe would like to have a rigging inspection performed by a rigger who was recommended by the Amel Service office here in Le Marin. Today is Veterans Day (called something else in France) and the rigger said he could not do this inspection until Monday. We talked to him yesterday afternoon and he said he would make an exception and come out to inspect the rigging this morning, even though it is a holiday. As I type this blog posting it is now after 09:00 and we have heard nothing from the rigger this morning. Maybe we are leaving today and maybe not until Monday or Tuesday. There are far worse places to be ‘stuck’ than here. We enjoy Le Marin very much.